We deliver your project when you need it and at the best possible price. At Burgin Pipe & Supply, we are strongly committed to providing solutions to the underground utility and agriculture industries. From water lines and municipal water mains to culverts and drain basins. If it moves water, we sell it. For the rancher, we sell only heavy, well-built equipment that is proven in the field and time tested. 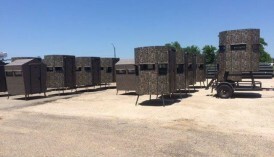 We have recently taken delivery of our new RANCH KING BLINDS. We looked for two years to find the best blind on the market and hope you agree. Check them out and let us know what you think. We custom fab just about anything for your project. Our trucks and trailers are ready to deliver solutions for your underground utility needs.